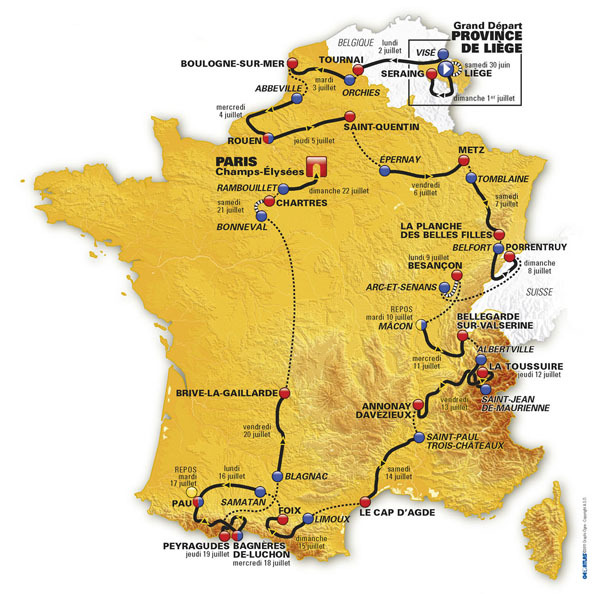 The Tour de France 2012 route was announced in Paris today. There were no surprises this year as the whole route was leaked last week when the stage list and map was accidently uploaded on to the Tour’s website. For British cycling fans it offers some great chances for spectating with stages on the northern coast, near the big sea ports. There’s also good news for Bradley Wiggins with twice as much time trialling than this year’s race – almost 100km. The race starts in Liege before heading through Belgium and up to Boulogne-sur-Mer before heading down to the Voseges mountains before the Alps. Only one stage, Albertville to La Toussuire is the only stage run entirely, deep in the Alps. The south of France comes next before the peloton heads over to the Pyrenees for two tough stages.